But I guess I'll risk it. I, at any rate, think it's very Thingish. Anyway, one of my readers had watched the tutorial series on making your own needle felted Pooh that I posted a while back, and she was kind enough to take the time to write a little note to thank me for the videos and to share some very interesting facts with me about the original stuffed animals that inspired the beloved children's books by A.A. Milne. 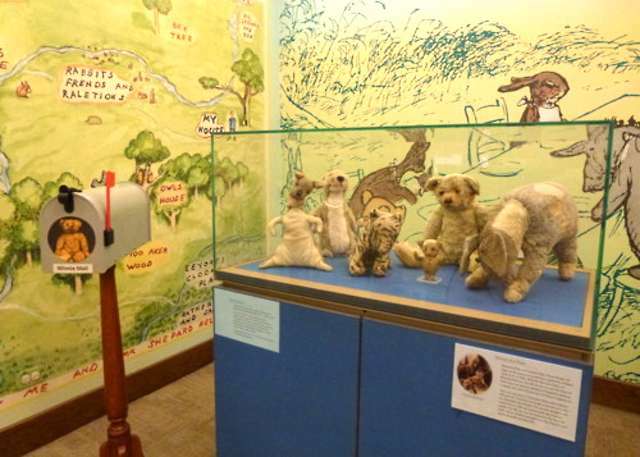 Like me, you may not have been aware (until now) that the original toys that belonged to the REAL Christopher Robin Milne are on permanent display at the New York Public Library. My reader, whose friend had been hired by Milne's publisher to do some conservation and cleaning work on the toys, got to "meet" Pooh in person and even give him a little squeeze before he went to his new home at the library. How cool is that? But do you want to know what my favorite "fact" was about the real toys? 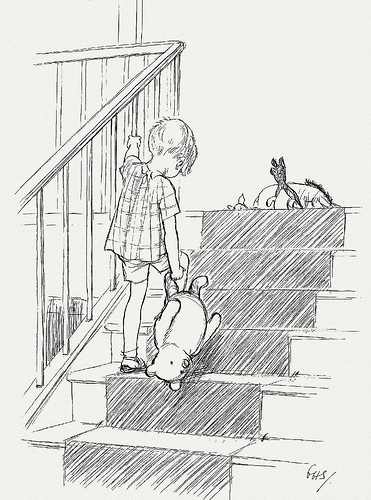 My reader's friend discovered that Pooh had one loose limb when she was doing the conservation work.... Guess which one it was??? So, if that's the case, I guess Pooh is a real Bear after all. I think that's my favorite passage from the Velveteen Rabbit. I remember watching all your tutorials. They were great, although I admit, never making my own Pooh Thingy. Yours is beautiful. So pleased just to look. Are you ever going to put any of your felted animals in your shop? They are so adorable, I may not be able to resist. !